Salome is a 1974 C&C 35 Mk II. C&C was a Canadian company that lead the racer-cruiser market during the 1970s. Its actually an identical sister-ship to Initram, a boat that underwent a similar re-power four years ago (http://sunchallenge.blogspot.com). We bought it in 2006 with its functioning, but unreliable Atomic 4. At one point, it ingested water after an early winter sail and seized before I could get back to the marina to take care of it. So I decided to pull it and do a complete rebuild. With all new pistons, rings, bearings, and carburetor, the engine should have been set to serve for another 10 years or so. I work on all my own cars and I didn’t object to working on the Atomic 4 either. 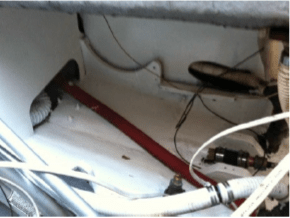 However, chronic problems – unreliable fuel delivery, low oil pressure, continued water incursion – just made boating an unpleasant experience for the entire family. Finally, after a disastrous summer in which three weekends were ruined because of the engine, something had to be done. My original intent was to find a re-buildable diesel, or maybe a freshly rebuilt one. A few turned up on eBay and some diesel trader sites, but I held back. Talking all the pros and cons over with my wife led us to the recognition that reliability, not performance, economy, or range was our top priority and that I probably wouldn’t seriously address that issue unless I went new. While checking out likely Kubota-based solutions, I also had been watching the developing electric propulsion technology. It was definitely a seductive prospect. I used to open the cockpit lockers, look down, and count the number of components I wouldn’t need if I had electric propulsion. A very compelling argument, but irrational fear of the unknown and a somewhat more rational fear of the cost of sufficient battery storage, held me back. Now, however, I was facing 8K for a new 25 HP diesel, plus accessories; well beyond the cost of electric which seemed be coming down as more and more players entered the game. I decided to look into it some more, and wrote to several vendors giving them the details of my boat. Two wrote back and said all the information was on their website. 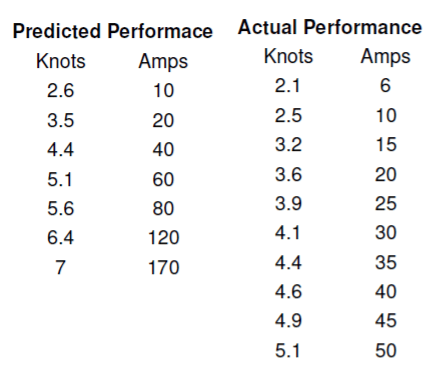 Mike Gunning of Electric Yacht wrote back with performance projections he had run using my statistics and, most notably, questions about my boat and plans. A few weeks later I met Mike and Scott McMillan at the Annapolis sailboat show where we talked at length about my boat and my expectations. The other companies at the show handed me a brochure. So in addition to really liking the frame that Electric Yacht had designed, I went with Scott and his team because of the interest they showed in the project. I got into computing during the heyday of the 1980s when it was a frontier of start-ups, garages and dreams. Talking with these guys echoed that energy in a way I just didn’t get from the diesel brochures. I decided to be a part of it and go electric. Mike’s data suggested that although my boat’s displacement was above the advertised range, the 10kw motor should suffice. The blogs detailing Initram’s performance with the same engine gave independent affirmation. I opted for the DIY kit which requires (slightly) more assembly and an a-la-carte rather than turn-key array of options. I ordered the frame and all the mounting brackets, plus the Clearview display from Sevcon. The Atomic 4 was direct drive so the propeller was a tiny two bladed 12×7 that even when clean barely got me over 4 knots. At 35′ 6″ and 13,800 lbs displacement, the 35 Mk II was well beyond the capacity of such a configuration. Unfortunately, I couldn’t go to a larger prop without changing the strut and shaft so I found a reconditioned three-bladed 12×10 propeller that would fit the original 7/8 shaft. While waiting for the motor to arrive, I went ahead and pulled the atomic 4 and all its related parts…heat exchanger, coolant overflow tank, fuel tank, fuel lines, fuel filter, external oil filter, oil cooler, exhaust riser, waterlift muffler, instrument panel, and about two miles of wiring. The motor is stripped down in my garage waiting for me to clean everything, reassemble it once more and sell it to someone with more patience and less budget than me. I took the opportunity to replace and/or re-route remaining wiring, completely replace my AC electrical system with a new three-circuit panel, clean and paint the entire engine compartment and space under the cockpit floor. I cleaned the prop shaft, replaced the stuffing box with a new one, and had the yard replace the worn cutlass bearing. I also compiled an excel data sheet to work through my battery bank choices. I’m a believer in letting the predominant use patterns guide my decisions, not the exceptions (as most critics of electric propulsion seem to do). 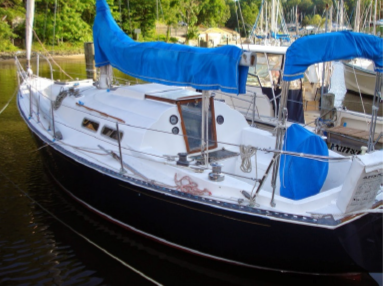 I sail in Chesapeake Bay, mostly weekend trips to the eastern shore. I tend not to motor unless absolutely necessary, so most of my engine hours accumulate in 15-20 minute spurts in and out of the marina. The longest I have ever motored in one day has been returning 25 miles from Oxford in the dog days of August, so that became my worst-case baseline for setting my capacity needs. LiFePo4 batteries sounded exciting but not even remotely within the budget. I heard much advice about the merits of AGM batteries but didn’t follow it in the end. Price was a factor, but what really got to me were countless blog accounts of people ruining AGM batteries prematurely through unintended miss-charging and even reverting to flooded batteries after discovering claims of more cycles at greater depth of discharge were based more on theory than track record. I read about TPPL batteries like the Odysseys that Initram used, but high charge acceptance rates offer little advantage if you can’t afford a high-performance charger. So I ordered a set of eight US 125 XC2 golf cart batteries from US Battery. They were a hair cheaper than comparable Trojans and offered free shipping. I took the advice of Scott at Electric Yacht and another of his customers in my marina and went with the 25 amp QuickCharge. Not the most modern or sleekest charger on the market, but priced right and (like the batteries) a solid reputation in the golf cart industry. liner. The batteries would fit sideways which I had read somewhere was optimal for avoiding spills when heeling. That’s how I had my house batteries mounted and never had a spill. I spent a very cold day in January with Bob Leightman (who had just become Annapolis’s new rep for EY) doing a trial run fitting the motor to the engine beds and aligning to the shaft. Once I thought I had it about right, I started drilling holes to bolt the engine mounts down and found that the stringers were made with plywood and would split when the lag bolts were screwed in. 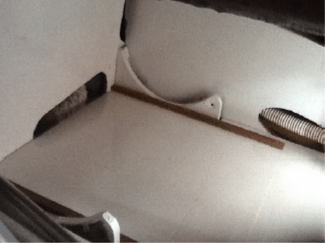 The original A4 had been mounted on some steel angle brackets bolted to the beds. I decided to make some identical ones out of aluminum and bolt them using the same holes. This made for a nice flat surface to align the motor on and were easily drilled and tapped to mount the feet. I mounted the battery switch, contactor and a buss bar against the starboard side of the engine room. The fuse I mounted on the battery box to be as close to the most positive post as possible. At a maximum draw of 180 amps, I calculated I needed 1/0 gauge wiring for the batteries and motor connections. I made up the wires myself using wire, lug terminals, shrink tubing and a hammer-crimper all purchased on Ebay. 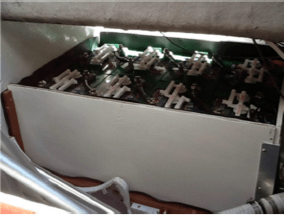 Moving the batteries into the box was a two person job: one to lower each batter down through the cockpit locker, the other to lie in the quarter berth and guide it into place. Then put the two removable sides of the battery box in place and anchor them. Reaching the vent caps to water the batteries isn’t as bad is I’d feared, though I’m seriously considering getting a battery watering kit that will let me adjust the water levels remotely with a primer bulb. The space opens on either side to the large cockpit lockers which have hatches are are ventilated with cowl vents. This should provide lots of open space for hydrogen to dissipate, though I’ve been thinking of how to construct a cover for the battery box and venting it with a hose leading to the cowl vents. I made a new instrument panel out of black Plexiglas to mount the Clearview, plus my depth gauge and some light switches. This replaced the old Atomic 4 panel with its four gauges, choke, ignition, etc. 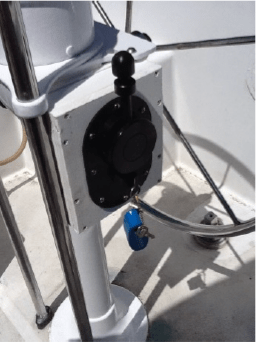 For the throttle, I constructed a box out of starboard and mounted it to the steering pedestal with the wire led down through the stainless steel guard rail. This required cutting and splicing the cable which I didn’t like doing, but the alternative of cutting a hole big enough for the plug was less attractive. I got some angle brackets from Home Depot to mount the charger against the engine room bulkhead over the engine. 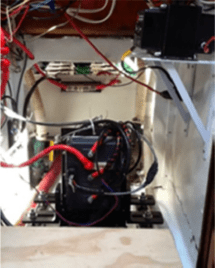 With all the components now in place, I could connect all the wires to the batteries and the engine according to the Electric Yacht wiring diagram. I first powered up the system just to make sure everything came on and no faults were raised. Still in the slip, I spun up the motor to verify that forward and reverse rotated in the correct directions. There was a visible wobble in the stuffing box and it seems like quite a bit of power needed to be applied in order to get the prop started spinning. I disconnected the coupling and took some more time adjusting the alignment until I could get the shaft to start turning at just one amp of current. There was still some slight wobble in the stuffing box which I’m still going to have to troubleshoot. Maybe I should have replaced the shaft after all. The first day out, the wind was about 10 knots right on our nose motoring out of the channel. We needed about 40 amps to get out and I was a bit discouraged at how slow it felt like we were going. After getting the sails up, we went to weather with a pretty good breeze. At above 2 knots, we heard the motor spinning around as the prop was freewheeling – most of the noise came from the belt and was frankly a bit louder than I had expected. I turned the key back on and the sound changed to a pulse rather than a steady whine and above 4 knots we started seeing -1 amp showing on the monitor. Early in the afternoon the wind died and we had a chance to do some flat water tests of the performance. We ran the motor up to 50 amps in 5 amp increments, letting it get up to speed and then checking speed and RPMs. 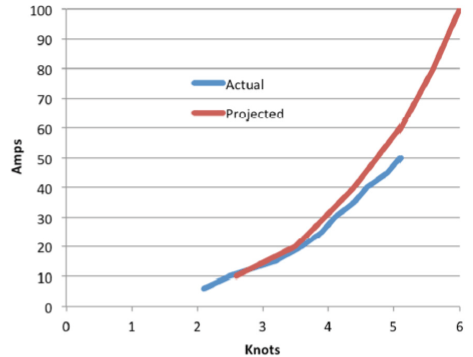 The results were encouraging; my system seemed to outperform the prediction by a small margin at all output levels. The numbers don’t really capture the full story. First, for the first time since we’ve had the boat, our plans for the day were not contingent on the engine starting. (The dog may take some offense since engine trouble-shooting tended to extend beach time). Second, maneuverability really was enhanced, both due to the switch to a three blade prop and the greater low-speed torque. Third, motoring was a quiet and relaxed experience with gauges being closely monitored more out of fascination than paranoia. Instead of a complicated system with multiple points of failure, we now have an entire propulsion system with no more moving parts than the alternator on my last system. Finally, the clean and odor-free environment down below has transformed the boating experience for everyone on board. 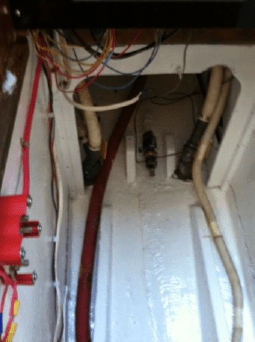 We’ve eliminated three different toxic and/or flammable fluids that we used to carry in three places each…the bilge, the engine, and containers to replace what had leaked from the engine into the bilge. That leaves only two cons to talk about. The first is range. 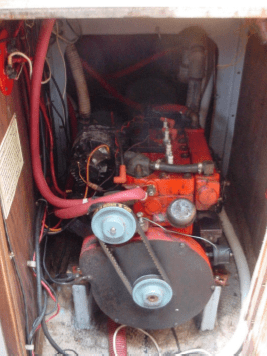 We’ll overlook the obvious fact that a gas/diesel engine that won’t start has a pretty limited range, and acknowledge that while most boaters would acquiesce on everything I said above, range is usually the deal-breaker. If you’re the type of boater that makes keeping a schedule a priority, then you’re not likely to be satisfied with electric. I avoid motoring till the last possible moment and, probably thanks to my experience with marine engines in general, regard my sails as the reliable backup for the motor, not the other way around. The intermittent and short-term cycles that characterize my use can not only be met by an electric motor, but are actually better suited to it than to an internal combustion engine. Making an honest appraisal of your own motoring habits, aesthetics, and patience has to be an essential part of the decision. 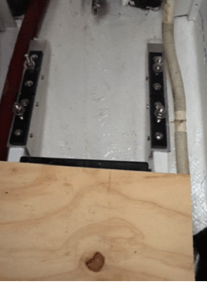 My original inquiry to Electric Yacht had been “can I make 4 knots at 30 amps?”, thinking that I could probably afford (and carry) a battery bank big enough to give me a reasonable number of hours at that draw. My actual results indicate that with a clean prop and freshly painted hull, I can get very close to that speed on only 25 amps. With the battery bank I have, I should be able to motor for 4-5 hours and still keep my batteries at an optimal depth of discharge. Going down to 75 or even 80% once in a while would give me even more distance and really shouldn’t kill the batteries if I charge them back up and water them promptly. I will probably follow the lead of several others and get a portable generator for a simple serial hybrid backup should I find the need for greater range security. As long as I keep the speed below 4 knots, I could substantially extend my range, as others with similar set-ups have confirmed. My second concern is simply learning to adapt to the changes in habit that accompany electric propulsion. While the motor itself is relatively maintenance free, the batteries do require some attention and careful handling: keeping them watered, not letting them sit uncharged, paying attention to depth of discharge. It’s not rocket science, but until it becomes routine, I’ll probably be paranoid for a while that I’ll manage to screw up and damage the batteries.